Hands up fellow mamas who can’t get through the day without a cuppa? Mums Need Tea, am I right??! So you can imagine my delight when the very lovely people at teapigs asked if I would like to review their new range of feel-good teas. Yes please! teapigs has been making tea for ten years and is a quality whole leaf tea brand. You know it’s going to be a good cup of tea when it comes from a funky, colourful teapigs packet. Clean n green is a tea to help you detox. Drink this first thing in the morning to set you up for the day. It combines green tea, lemongrass, ginger, coconut and cleansing dandelion leaves, which are packed full of antioxidants. I love this tea. I’m used to drinking green tea first thing, but this has an extra kick and is really refreshing. It gives me that morning boost that I need to get on with my day. The active ingredient is dandelion, not something I’d considered drinking before but I have to say, I’m a convert! Clean n green is definitely a new favourite of mine. Next is Up beet, a tea to give you energy. I have to confess that when I hit that afternoon slump, I usually end up making myself a hot chocolate. I know, not great. So instead of reaching for the cocoa powder, I’ve been brewing a cup of Up beet instead and, I have to say, I feel so much healthier for it. Up beet is a beautiful bright purple and has quite a strong, punchy flavour – you may find it takes a little getting used to. Its blend of hibiscus, ginger, green tea and beetroot (yes, beetroot!) definitely perks me up and helps me get through the rest of the day. It’s great knowing the energy boost is from healthy ingredients rather than sugar. Finally, we’re on to Snooze, a tea to help you sleep. I haven’t been sleeping well lately. There has been so much change recently with Ethan starting school. I am, however, obsessed with getting a good night’s sleep and I’m always up for trying new things to help me get some quality shut-eye. Snooze contains a mix of chamomile, apple and lavender. I wasn’t sure about drinking lavender but actually it’s really delicate and the tea is very soothing. I can imagine drinking this during the winter, snuggled under a blanket in front of the TV. teapigs suggests having this right before bed, but I had it a couple of hours before going to sleep, otherwise I knew I would be up during the night (I know I sound a bit old). This is a lovely new range of teas from teapigs. I love that they’ve been designed with mums in mind, to help us through our busy daily routines and provide a little pick-me-up when we need it most. They’re healthy but they taste good. I’m really pleased I’ve been able to ditch my afternoon hot chocolate (I do still have it occasionally as a treat) and overall, I feel much better for it. 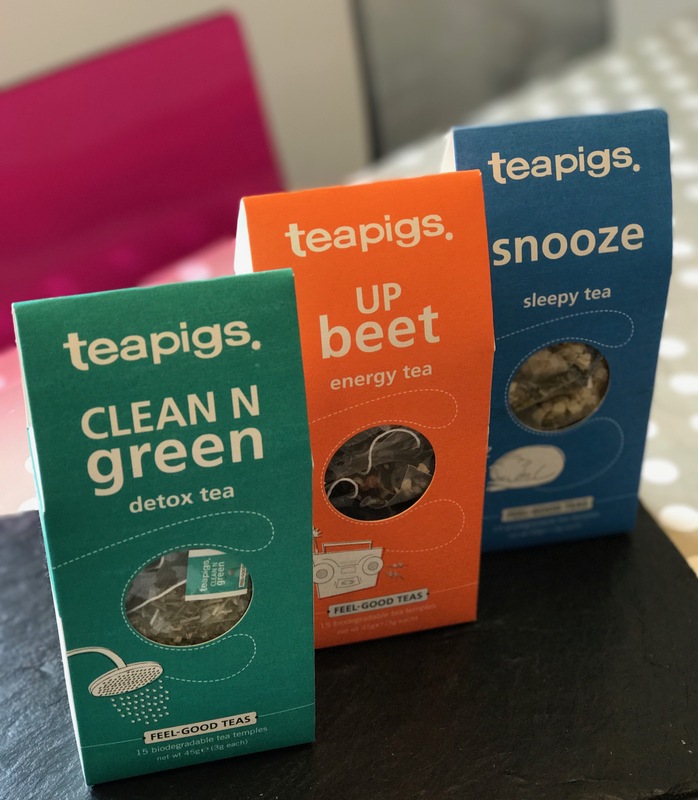 If you’d like to give these teapigs feel-good teas a try, you can buy them here. Thank you very much to the fab teapigs team for sending me these feel-good teas to try. Ultimately, helping our mamas to feel good is what Mums Off Duty is all about.